'They Hosed Them Out' a well-written account of war exploits. 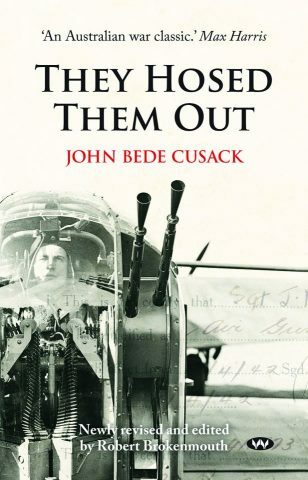 JOHN Bede Cusack's novel of wartime flying is a thinly disguised autobiographical account of his own wartime exploits. This is what makes They Hosed Them Out such a riveting read. This book is regarded as a classic Australian war novel, a well-written account inspired by the author's experiences as an Australian air gunner serving with the Royal Air Force at the height of the air war in England and over Europe during the Second World War. The hero of this novel is known as John Beede and he tells of a rollicking ride through the awful days of the Second World War when the life expectancy of air crew was extremely limited. This meant these young men lived life to the full, enjoying plenty of beer, social life and amorous encounters as they tried to come to terms with the possibility of instant death in flying coffins. The title itself brings home the awfulness of the air war where a human body is no match for shells fired from a German fighter. Indeed, the book details one example where the remains of a rear gunner were "hosed out" of a blasted gun position. This new, revised and annotated edition includes chapters never before published, a fascinating biography of John Bede Cusack by his daughter, Kerry McCouat, and an informative introduction by editor Robert Brokenmouth. Cusack tells of his flying experiences, life in wartime England, how the black market thrived, and how he survived. It is a well-written account of wartime exploits which many in Australia know little about.